Starring Lupita Nyong’o, Winston Duke, Evan Alex, Shahadi Wright Joseph, Elisabeth Moss, Tim Heidecker, Kara Hayward, Anna Diop, Cali Sheldon, Noelle Sheldon, Madison Curry, and Yahya Abdul-Mateen II. Opening up with some text, Us drops some knowledge stating that there are thousands of miles of tunnels underground, many of which have no actual purpose. Now, maybe it sounds pretentious of me to assume that I thought I knew where writer and director Jordan Peele (the comedian turned horror mastermind that instantly became one of the top five must-watch filmmakers working today with his explosively terrifying exploration of race relations, Get Out) was going with it, and in a small way I did, but he’s not afraid to make things even weirder right out of the gate. The opening 10 minutes contains everything from a flashback to the 80s, an advertisement for Hands Across America, and an ominous credits sequence set to the imagery of bunnies, slowly panning the camera back to reveal more and more with symmetrical framing all while set to haunting ritualistic singing. That’s the first 10 minutes. At 110 minutes in, Us becomes fully realized mind-shattering nightmare fuel. For those that are not particularly interested in a challenging experience, the film is still relentlessly intense and meticulously stylized to such extremities that every single frame is bursting with some kind of frightening visual. Simply put, the marketing has told everyone all they need to know; Us is about a family visiting their beach summer home in Santa Cruz (it’s also worth noting that even relaxing environments are photographed from striking angles that are also always imbued with the looming sensation that something about the area is off) who become terrorized by their doppelgängers (known as the Tethered) on their first night of vacation. 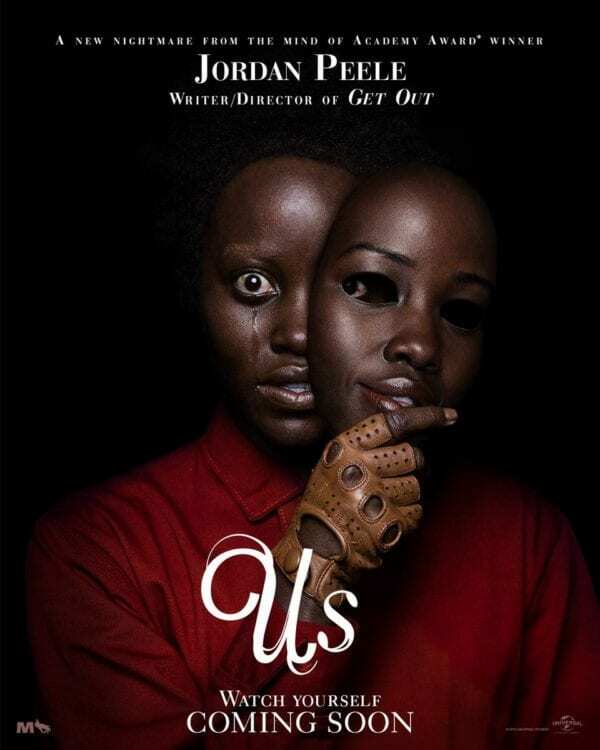 Jordan Peele wisely pins the majority of the narrative and character growth on Oscar-winner Lupita Nyong’o’s Adelaide, an introverted and loving matriarch with a past connected to Santa Cruz (I sincerely believe that one of the numerous strengths of this film is that the trailers gave away practically nothing about the story, a rarity in this day and age, so I will be doing the same in return for this review) giving her gut-feeling bad vibes about the supposed peace and relaxation. As the film goes on, she goes from freaked out and submissive in the face of the mirror family, willing to preserve the lives of her loved ones at any cost, to a fearless take no prisoners replica slaying fighter hell-bent on survival. There’s a moment where she defiantly snaps back to her husband Gabe (Winston Duke, serving as both a combination of comedic relief and highly likable family man that occasionally says and does boneheaded things to his wife) that he is not dictating the shots anymore. It’s also more than just a moment where Jordan Peele and Lupita Nyong’o cement Adelaide as one of the true great badass heroines of cinema, it’s where he completely hands the story over to her, and rightfully so considering both the bigger picture of the narrative and little subtleties going on. So much of Us goes beyond family into something more reminiscent of social unity. Together, Jordan Peele and Lupita Nyong’o use a story about murderous doppelgängers (they are decked out in red jumpsuit almost resembling prisoners, utilizing everything from swift running, spiderlike crawling, and playing on fears, all with perfectly calibrated twitchy movements that are nothing short of disturbing) to remind us about some of the things we take for granted. And you lose all of that without her harrowing performance; Nyong’o is an emotional powerhouse as a mother and flat-out disturbingly unhinged as a shadow figure. The direction also finds a way to contrast their parallel yet different personalities in a climactic sequence that proves to be hypnotic, intense, and tragic all while employing a heart-racing remix of the beat from Luniz’s “I Got Five on It”. The various settings are also diverse and maximized for their full potential, ranging from an extended sequence inside the summer home to a nearby local amusement park to a classroom, all with claustrophobic spacing. There’s a small stretch where the movie tracks a character from location to location, bringing back memories to tightly corridored old-school survival horror video games. The doppelgängers themselves feel inspired by a mixture of The Evil Dead‘s Deadites and, well, doppelgängers from the twisted imagination of Jordan Peele. Even in broad daylight, scares and terrifying imagery remain plentiful and potent. Meanwhile, supporting players Elizabeth Moss and Tim Heidecker are perfectly cast and are given more to do than one might assume. 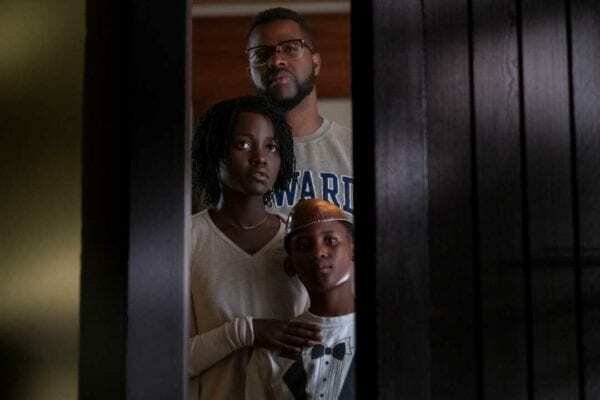 It will also be criminal to not mention how terrific the children are (Shahadi Wright Joseph and Evan Alex); rather than make them annoying and useless, Jordan Peele turns at least one of them into a resourceful killer. In general, Jordan Peele can appear to be heading down any genre cliché and turn it on its head into something unexpected with substance. If there are any small shortcomings to be found within Us, it’s that Jordan Peele has the habit of allowing doppelgänger Adelaide (by the way, the doppelgängers are all credited with very intriguing aliases that likely relate to certain themes) to briefly interrupt the flow of tension with huffing and growlingly distorted expositional dialogue detailing bits that feel obvious, but probably need to be explained to a mainstream viewer. Also, as much as I admire his ability to interject humor into all kinds of distressing situations, there is one joke here that lands but unfortunately is forced to go on longer than necessary due to its context. Aside from that, small interactions such as the family using how many confirmed kills they have to determine who drives a vehicle are nothing short of hilarious. Forget all the talk of which prestigious filmmaker Jordan Peele is going to replace, as that’s an insult to his talent; he’s the first Jordan Peele, a superb filmmaker that can blend different styles of horror and social commentary distilled with his own trademark brand of humor. Us is both gruesome and challenging, the kind of movie worth dissecting on multiple viewings and one that demands to be instantly reanalyzed upon it’s ending. 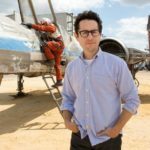 It’s messages work on small and global scales, while the Tethered are sure to unsettle everyone as moviegoers run home to hide every pair of scissors. Even when the plot is melting your brain, the high concepts never feel overbearing to the point of intruding on the suspense. 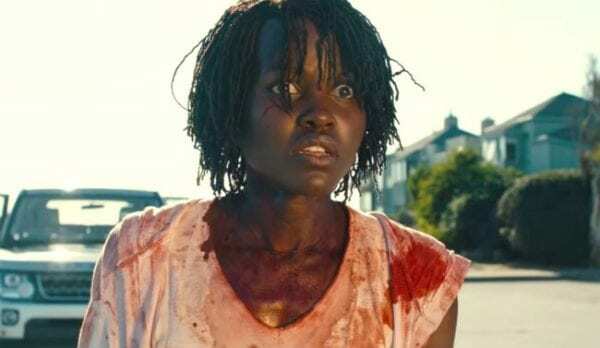 Credit all that to the mind of Jordan Peele, but without Lupita Nyong’o to ground the terror into something relatable and deliver a pair of arresting dual performances that yield reactions all across the spectrum, there would be cracks. As is, Us is a phenomenal piece of work that will leave you pondering it long throughout many nights, and assuredly with the lights on.